Fleet Sizing, Fleet Management, and Strategic Frameworks are critical for a robot taxi platform’s proper execution. The below ideas are some of my favorite that span these topics. 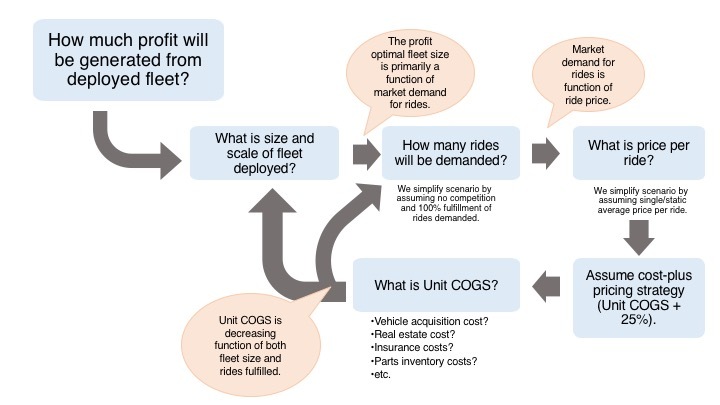 1: While market demand for rides drives fleet-sizing decisions (supply-deployed), so in turn, does supply-deployed drive market demand for rides. It is a circular reference that must be solved with iterative modeling. Consumer demand for AV rides is a function of ride price that the platform charges, which will be a function of the platforms cost-per-ride. A platform’s cost-per-ride is a function of its scale, both: A) its total fleet costs and B) its volume (ie. rides). 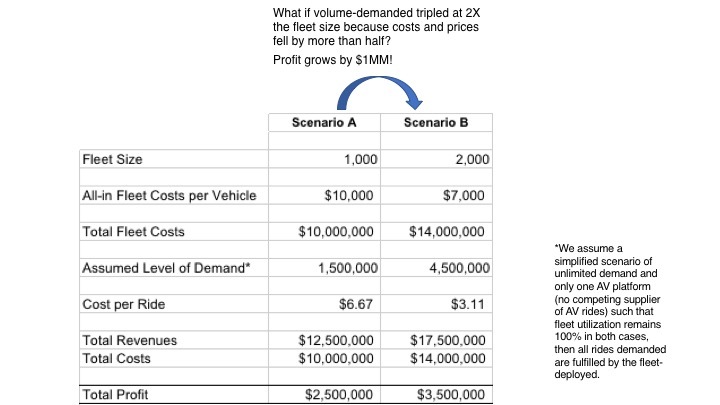 As a result, to determine a profit-maximizing fleet deployment, one must run iterative fleet-sizing models that incorporate a dynamic market demand response from changes in prices enabled by different sizes of fleets. Generally, larger fleet sizes enable the fleet deployer to pay lower wholesale prices when procuring: vehicles, real estate, parts inventory, vendor contracts, insurance, even labor, etc. The below table is a hypothetical example of the effect of lower costs on ride demand and profitability. 2: The profit-maximizing fleet to deploy will fulfill <100% of demand. Due to the non-uniformity and spikiness of the demand curve for rides (see below chart), there is an inflection point (i.e. a level of demand) at which the marginal revenue gained from fulfilling an incremental ride-demanded starts to decline. Fulfilling these incremental units of demand beyond the inflection point is more expensive because responding to large swings in demand requires disproportionately greater fleet sizes than that required to fulfill the more consistent and uniform areas under the demand curves. As a result, if profit maximization is the goal, a given AV team will not size its fleet to accommodate and fulfill all of a given market’s ride-hailing demand. The platform would be wise to let driver-based supply and competing AV supply fulfill remaining market demand. Realistic demand curve shape modeled after today’s ride-hailing demand for a representative week. 3: Speed-to-market and network effects will be an even more important determinant of success for tomorrow’s robot taxi and delivery platforms. The first-to-market robot taxi platform will choose to deploy a fleet size that serves a profit-maximizing share of the market. As a result, when an entrant faces making their own fleet-sizing decision, they will assess the market share already being served and the size of the remaining unfulfilled market. Deploying a fleet size aimed at serving more than the unfulfilled market demand is a financially risky endeavor due to the non-zero probability of failing to capture the incumbent’s market share, leaving the entrant with an underutilized fleet. This will deter the entrant from attempting to take market share away from the incumbent and enable the first-mover/incumbent to hold onto its market share. 4: Market for shared-ride products (ie. Uber Pool and Lyft Line) will shrink, and this should impact fleet-sizing decision. Fares for point-to-point AV rides will approximate today’s Uber Pool and Lyft Line fares. As a result, much of today’s shared-ride demand will shift directly to point-to-point rides. Interestingly, this state change needs to be considered when using today’s market demand data to estimate market demand for robot taxi services. 5: Much cheaper and better performing solid state LIDAR sensors should be factored into longer-term fleet-sizing decisions. According to Velodyne, solid state LIDAR sensors promise to be much cheaper (hundreds instead of tens of thousands of dollars) and available for sale in 2018, thus lowering the cost of the vehicle substantially. This changes optimal-fleet-size calculations. 6: Letting external AV suppliers on a platform would potentially be a risky move, especially in short-term. By letting external AV suppliers on your ride-hailing platform, the AV supplier may be able to collect valuable trip demand data that could enable them to effectively launch a competing platform in the future. Similar consumer identification information could also be collected that would enable the AV supplier to market to the consumer and attract them to a different platform, whether theirs or a competing. 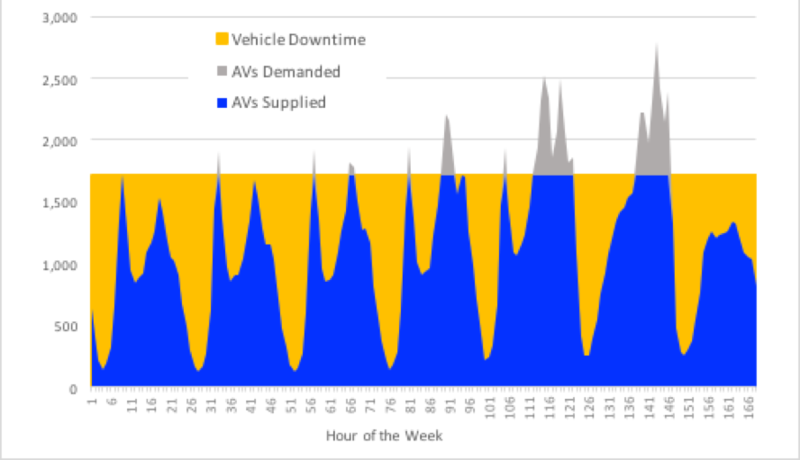 7: The time an AV spends on refueling and data bag transfers will be some of most important day-to-day inputs into the fleet sizing decision. 8: Ride-monetization products and services are a competitive advantage. While nearly every AV team have similar costs of capital, each team does not have the same ability to create ride-monetization products and services that enable the ride-hailing platform to generate further economic rents from a ride. The most obvious example of ride-monetization opportunities is in-car advertising. These additional economic rents create a virtual cost structure advantage because it enables the platform to charge lower ride prices and still make a profit off each ride. 9: Brand loyalty will continue to be an opportunity. Robot taxi platforms and the autonomous vehicles themselves may quickly become undifferentiated commodities like the airline industry. Most consumers are not loyal to any particular airline and happily switch to the lowest cost provider. Similarly, we don’t check the type of plane used for flights before booking. For most travelers, the purchasing decision is driven primarily by length and cost of the flight. Lack of differentiation and low switching costs — as perceived by consumer riders — could persist as a major challenge for the platforms. To avoid a “race to the bottom” and low margins, ride hailing platforms need to find an effective way to keep consumers from switching to competitors. There are many possible opportunities here. Two of which are subscription-based models and integrations with external products. 10: As some of the largest potential consumers of fuel, AV platforms may vertically integrate downward and upward in the energy supply chain to acquire refueling stations and fuel resources — whether the fleet is electric or hybrid vehicles. Because time spent refueling and driving to refueling stations are key drivers of vehicle downtime, controlling fueling stations in close proximity to ride demand is not only attractive but likely required. AVs will not be able to refuel themselves (thus necessitating humans to plug in or refuel the vehicle) and AV fleet operators will need to know exactly which refueling stations are available for refueling in real-time. The remaining question is whether gasoline or battery refueling stations will be needed. 11: Fleet managers may not be the fleet owners. A robot taxi platform (e.g. Uber, Lyft) might manage the third party owned fleets to maximize fleet uptime and know precisely when the vehicles are available for use. Conversely, the platform or the manufacturer may own the vehicles, and outsource fleet management to a third party. All models are on the table, but some certainly provide operational and readiness advantages. 12: Computing profit-optimal fleet size against a non-uniform demand curve requires a model that iterates through the demand expected in each narrow time interval (e.g. hour) over a large representative period of time (e.g. two weeks). 13: Fleet-sizing and infrastructure (e.g. personnel, real estate, equipment, etc) questions are best structured/solved as a “capacity-planning” problem, wherein demand for the resource is quantified as units of time needed over a period of time. 14: When choosing between internal and external fleet management options, the most critical and difficult variable to compute is the value of getting to market faster than the competition. These ideas are all my own and not in any way those of my previous employer. Please shoot me a note or add a comment with feedback or if you would like to discuss. I read them. Thanks for reading! This entry was posted in Autonomous self-driving vehicles, Business, business strategy, technology, Urban mobility by Jason. Bookmark the permalink.